It’s become a standard part of my dwindling Amazon shopping trips that I check the reviews and merchants carefully to make sure I’m not buying a poor-quality counterfeit of the item in question. But not everyone is as suspicious as me — especially when Amazon sells the counterfeit under the official listing for the original. The creators of a popular doodad had this happen to them, and they aren’t happy. 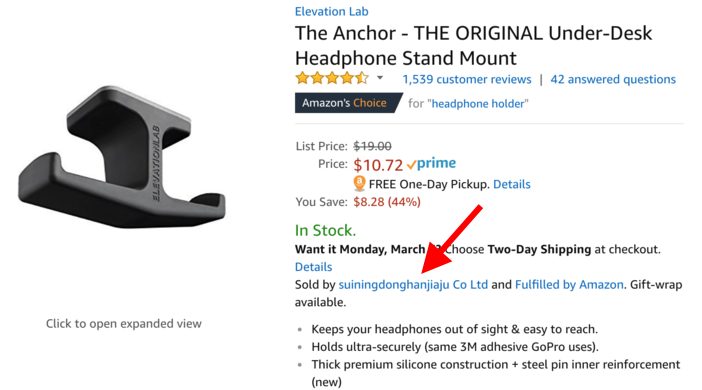 You may be familiar with the product: The Anchor, a handy little item that sticks to the bottom of your desk and provides a place to hang your headphones out of the way. An effective but simple accessory — simple enough, in fact, that a Chinese company (good old suiningdonghanjiaju Co Ltd) made a knock-off and listed it under the original, capturing all sales for five days. The company that makes it, ElevationLab, put up a blog post explaining how this happened and how easy it would be to prevent. Retailers that are the sole licensed manufacturer and seller of an item, he suggests, should simply be able to check a box saying so (presumably with documentary evidence), and pirates and resellers will be out of the running. It’s not quite that simple, of course — part of Amazon’s draw is that it’s an open marketplace and if you have, say, 10 good-as-new Apple laptop chargers, you should be able to sell them for whatever price you think they’ll fetch. Amazon can’t allow merchants to nix all resales of their items at will. And in fact, there is a way to do this: the Brand Registry lets sellers register their trademarked products to prevent or more quickly identify counterfeit goods. Brand Gating is a more extreme version, like what ElevationLab had suggested but so far has been unable to gain access to. But it’s hard to tell how effective the system really is if a company like ElevationLab with a popular product duly registered with Amazon can have all its sales hijacked for five days straight. Losses like that really hurt small businesses, to say nothing of the time and effort it takes to stamp out the counterfeiters. Although the company is now back to selling its own product, Floyd noted that the last case took four days to shut down the other seller, and there’s no dedicated representative for them to speak with. I’ve asked Amazon for comment on its practices here and resources available to sellers, and will update if they get back to me. The problem has been a problem, and a serious one, for so long that one wonders how much Amazon really cares. After all, they get their share whether it’s ElevationLab or suiningdonghanjiaju Co Ltd that sells the item. Dozens of trash products — knock-offs, poor-quality cables and other junk — increase the apparent variety for customers and exert price pressure on reputable manufacturers. I wouldn’t demonize Amazon in this if a solution were not something the company would normally pursue. Where are the machine learning systems predicting that a given seller account is untrusted? What about the image analysis that identifies potential counterfeit products? The live notifications to merchants that they are no longer the primary seller of a brand-registered product? In the meantime, small businesses are increasingly selling direct to the consumer using their own storefronts, skipping the middle man altogether. If you want to be sure you’re getting the genuine article, buy it directly from the people making it.